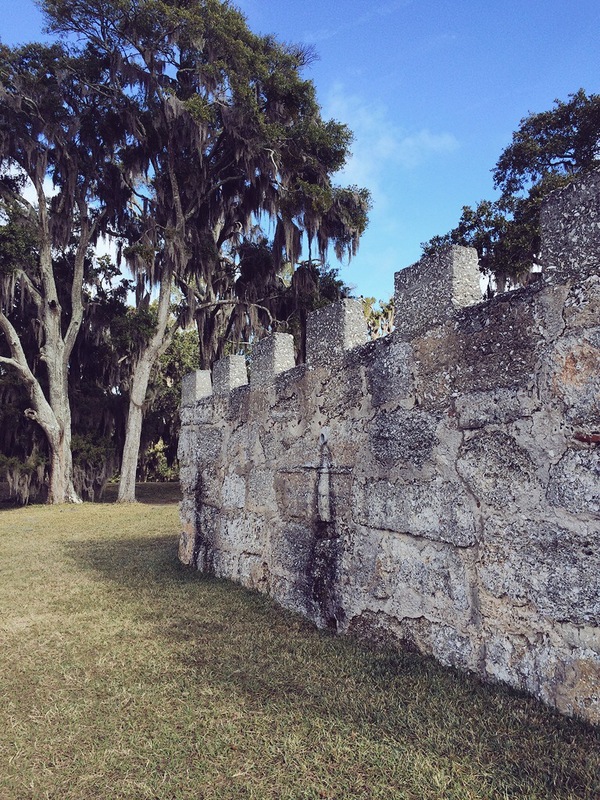 Coasting: Three reasons to stroll through Fort Frederica on St. Simons | Oh, the Places We See . . .
You may think that visiting a fort would be at the bottom of your to-do list when coasting. After all, beaches beckon. Or pastimes — shopping, fishing, golfing, and the like — call you to while away your leisure hours. 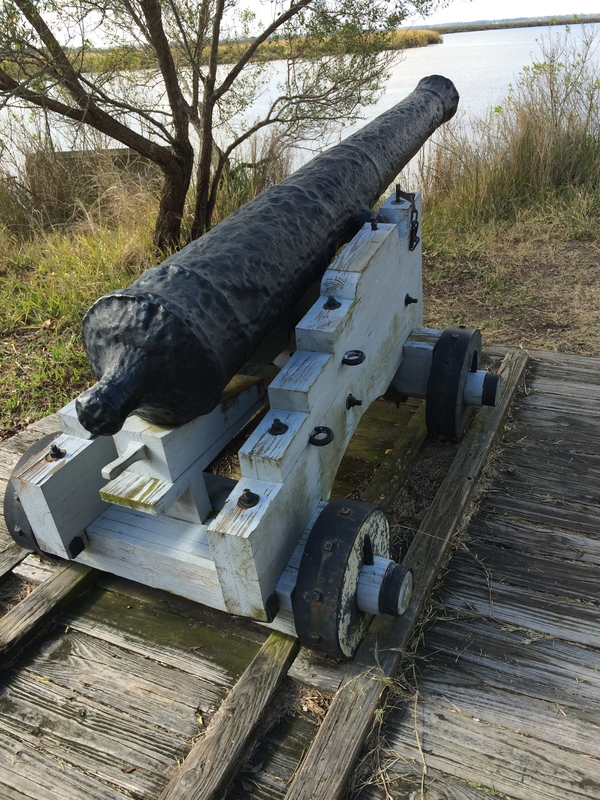 But on this tour of coastal Georgia and Florida sites, we found three forts — not just for visiting — but for really “getting into”: Fort Frederica on St. Simons Island, Georgia; Castillo de San Marcos in St. Augustine, Florida; and Fort Clinch State Park on Amelia Island, Florida. Seeing what remains of Fort Frederica would be awesome in its own right, but thanks to the Park Service, this National Monument (established 1936 under Franklin D. Roosevelt’s administration) is well maintained and carefully documented so that the visiting experience is rich on many levels. For the meager entry fee of $3.00 (free if you’re under 15), you’re offered a museum with artifacts and park film well worth 23 minutes of your time. Exit the Visitor Center and enter Frederica, a fortified town as well as a fort, with at least three good reasons to make this a stopping-off place on any Georgia coastal tour. Named for Frederick Louis (Prince of Wales 1702-1754), Fort Frederica was a military outpost established in 1736 by James Oglethorpe to protect the southern boundary of Georgia (a new colony) from the Spanish in Florida. And the fort paid off. In 1742, Spanish forces invaded St. Simons Island at Fort St. Simons (site of the lighthouse). But after two battles — Gully Hole Creek and Bloody Marsh — the Spanish retreated, never to return. Victory fell to the British but also signaled the end of Frederica. In 1749, the government abandoned the garrison, and by 1755, few residents remained. Well-placed markers lead visitors to an understanding of where and how soldiers lived and fought and why the location in the bend enabled control of ship traffic on the Frederica River. 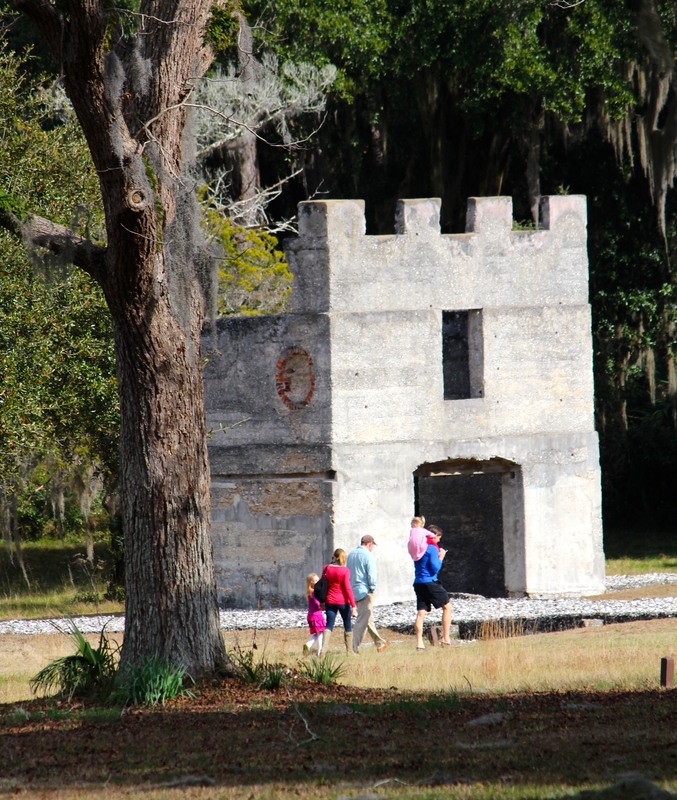 At its peak, Fort Frederica was a “town” of about 800 to 1,000 people. Notably, the Reverends Charles and John Wesley ministered to the soldiers and settlers at the fort, one of the many efforts that led to the establishment of the nearby Wesley Memorial on the island. At the time of the Spanish attack in 1742, about 200 British troops were stationed at Frederica with some of the officers and married men living in their own homes or in town. The barracks, with walls one foot thick, could accommodate more than 100 men. Three walls of this tower have been preserved and stabilized by the National Park Service. According to one of the markers near an excavated site, Frederica’s residents were literally “butchers, bakers and candlestick makers,” with many of them working more than one trade. John Caldwell, for example, made candles and fine soaps but also served as “Conservator of the Peace” when he wasn’t a merchant, shopkeeper, and baliff. His home shows the remains of a baking oven and two fireplaces, indicating that it was one of the finest homes in the area. 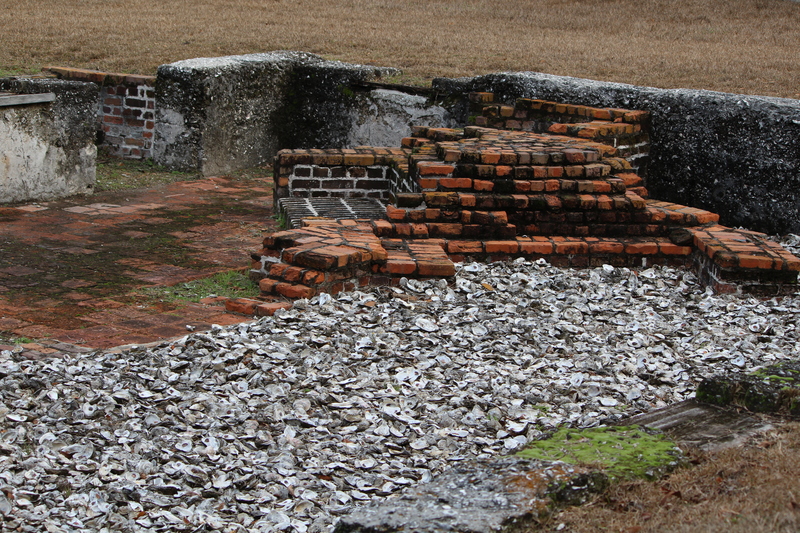 Remains of John Calwell’s home, one of the finest at Fort Frederica. Excavations also revealed the foundation of the home of Mary Musgrove Matthews, General Oglethorpe’s Indian interpreter, the daughter of a white trader and Creek Indian mother. (According to the Fort Frederica website, Yamacraw Indians, a group of Creeks, lived among the other settlers at Frederica.) 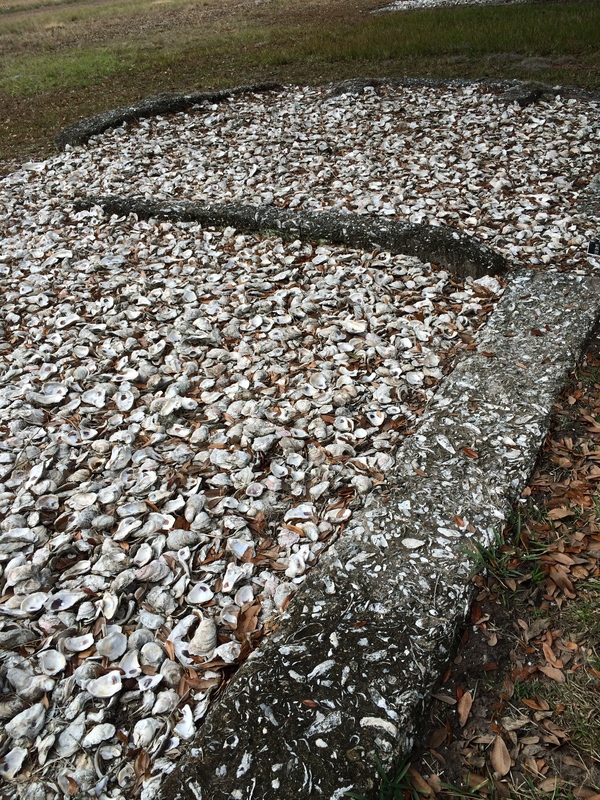 Her house was made of tabby, a type of concrete made with water, sand, lime, and oyster shells. Close-up of tabby from the home of Mary Musgrove Matthews. Tabby is a type of concrete made with water, sand, lime, and oyster shells. 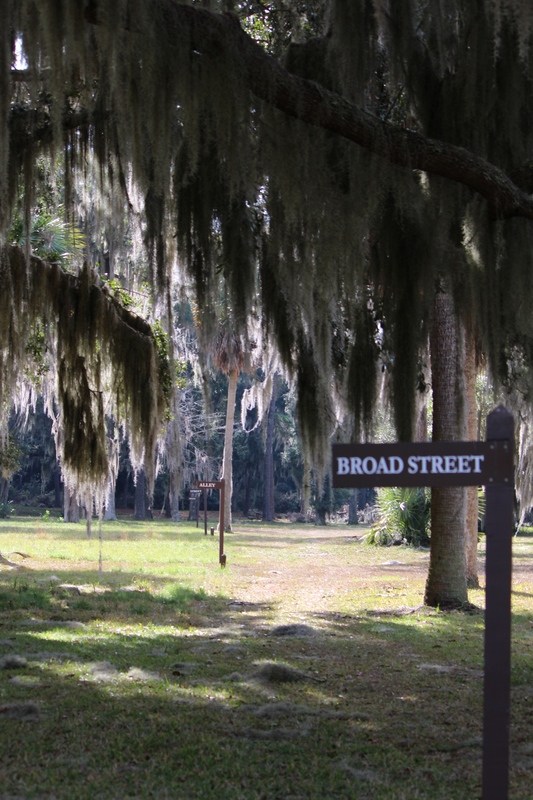 Fort Frederica‘s park-like setting still bears street signs indicating how the “town” was laid out. And today, majestic trees draped heavily with Spanish moss offer a canopy like no other site we’ve seen. From the website’s FAQs came this interesting tidbit: None of the trees present today were onsite at the time of activity at Fort Frederica. We found ourselves looking sideways at the pathways and trees, but also looking up. Rumor had it that we might see a bald eagle. We didn’t. 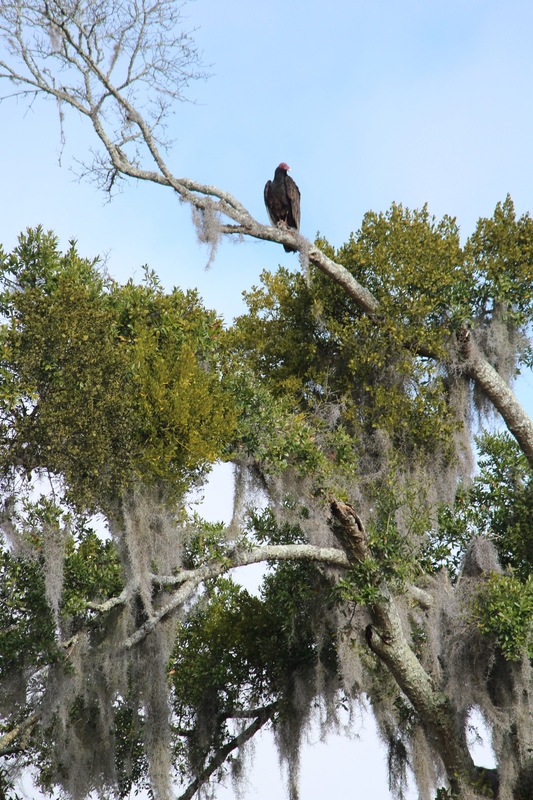 But birds flew over, above, and into nests high up in the trees — as visitors snapped pictures and listened to the sounds overhead. 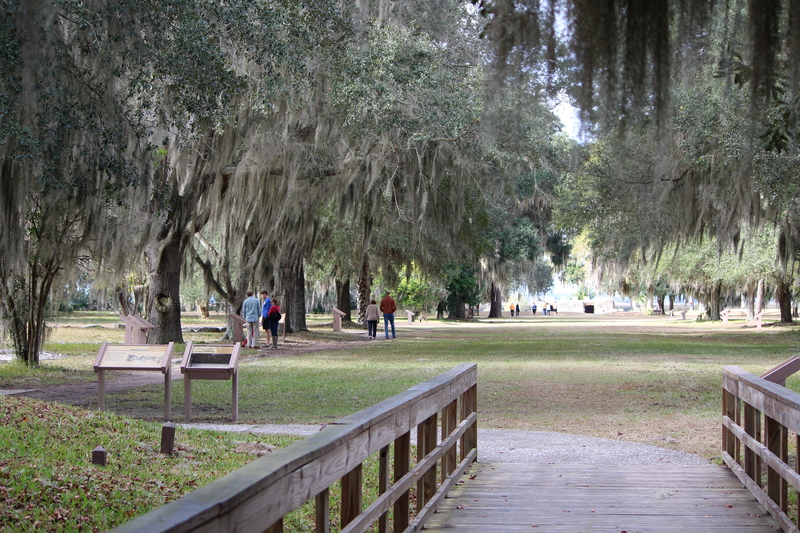 Plan to spend a couple of hours at Fort Frederica National Monument. With the wealth of information at the Visitor Center and along the outstretched pathways, you’ll be hard pressed to rush through — and you won’t want to. 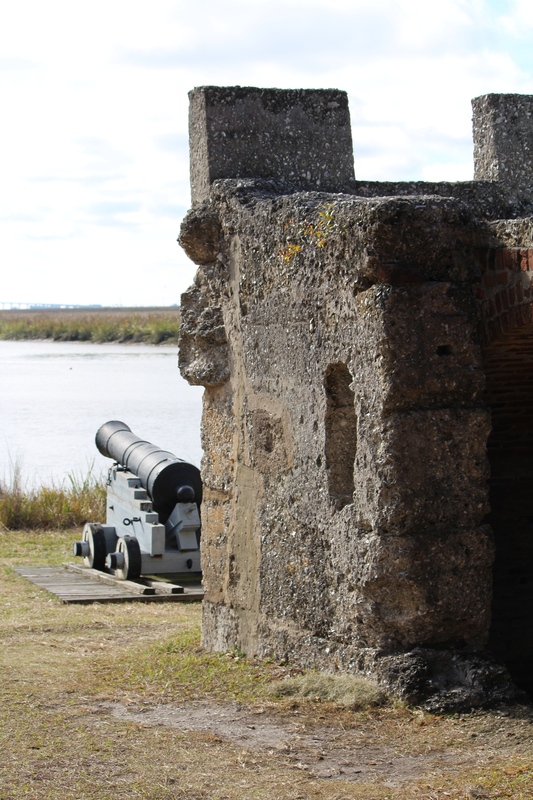 Whether you’re a history buff or nature lover or both, you’ll be pleased that Fort Frederica is preserved and ready for you to enjoy. Visitor Center: Open 9:00 to 5:00 seven days a week except for Thanksgiving, Christmas, and New Year’s Day. This entry was posted in Coasting, Georgia and tagged Bloody Marsh, ExploreGeorgia, Fort Frederica, James Oglethorpe, John Caldwell, Mary Musgrove Matthews, National Park Service, St. Simons, tabby. Bookmark the permalink. Thanks for sharing, great finding your blog. We’re very glad you found our blog, too! Thanks for the compliments. We didn’t know what tabby was either, so the markers at these sites are really helpful to all of us. Later, we found tabby construction at several sites. Best wishes for staying warm this winter! Our pleasure! So glad you toured right along with us. It’s fun learning new things even at our age, so we’re happy to share with others.